Located Charleston's Historic District, and adjacent to Marion Square, The Courtyard Charleston puts you in the midst of the city's historic charm, coastal lifestyle and culinary talent. 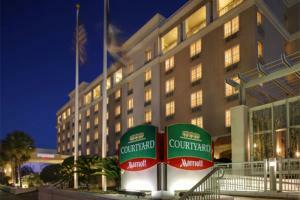 Modern and spacious accommodations feature flat-screen TVs, complimentary Wi-Fi, refrigerators and coffee machines. A heated outdoor pool and fitness center help you keep your workout routine on track. Open for breakfast and dinner, The Bistro serves up delicious American classics.